When you run a successful restaurant, business survival depends on the ability to quickly detect and suppress fires. StateFire DC Specialties delivers with factory trained technicians, ready to provide installation, maintenance, servicing and inspections of Automatic Kitchen Fire Suppression Systems. Our StateFire Team will partner with you from design to production to meet your businesses daily needs. StateFire provides 24-hour emergency service to minimize downtime and keep your business running smoothly. Every year approximately 5000 restaurant fires are reported with total property losses reaching $80 million. These fires originated in the cooking area, which then explode into the exhaust system and onto the roof where the fire can quickly spread. Grease fires burn very hot (approximately 1400 degrees). With this kind heat, fire spreads very rapidly. 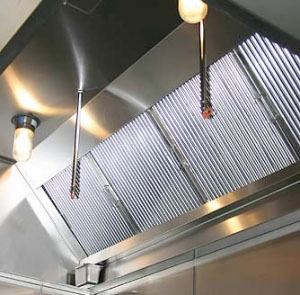 Keeping a grease-free and fire-safe kitchen exhaust system can protect your restaurant from fire hazards. Regular and thorough maintenance of the hood and exhaust system will help to ensure a secure environment for cooking. A system that is safely working at ultimate performance will lead to a working environment that's cooler, cleaner and more productive for the staff. StateFire DC Specialties uses proven methods for removing grease and flammable residues from the interior surfaces of the hood canopies, filters, duct work and exhaust fans. We ensure compliance with all applicable fire and health codes. We steam/hand clean the entire hood and duct system from top to bottom. Every part of the system including the exhaust fan is cleaned to bare metal in accordance with IKECA (International Kitchen Exhaust Cleaners Association) and NFPA 96 Standards for Ventilation Control and Fire Protection. - Reduce odors and excess smoke caused by grease and oils. - Helps maintain air balance in the kitchen. If the kitchen becomes positive air pressured, kitchen odors can leak into the dining area. Note; if the exhaust fan becomes heavily greased laden, it will slow down reducing the amount of air being exhausted effecting the air balance in the kitchen. 3. Provides a safe and clean work environment for employees, and customers. 6. A thoroughly cleaned exhaust fan run at maximum efficiency reducing wear to the motor, bearing and fan belt. 7. A thoroughly cleaned exhaust system to bare metal will reduce the redeposit of grease on to the metal surfaces. The smooth clean metal surfaces within a clean exhaust system is more difficult for grease to attach to then a rough grease laden surface. At StateFire DC Specialties, we understand the importance of a properly maintained kitchen exhaust system and what it means to your business. We also help make sure you're always in compliance with the latest industry regulations. Contact StateFire DC Specialties to learn more about our service offerings.